Neck pain is a very common condition, especially in those over the age of 50. Pain of the neck is the second most common reason for one to seek care from a chiropractor. There is an abundance of reasons why neck pain occurs. Some of the most common reasons include poor posture, spinal arthritis, neck sprains, and whiplash. Some less common, but more serious causes of neck pain are infection, spinal stenosis (narrowing of the spinal canal), and rheumatoid arthritis. Arthritis is one most common reasons for neck pain. Neck arthritis is often associated with age. 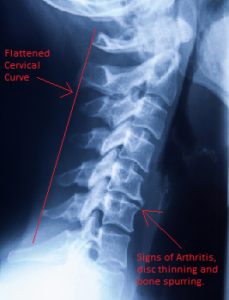 Usually, by the age of 35 or 40 years old subtle signs of arthritis and spinal degeneration can be detected on x-rays. 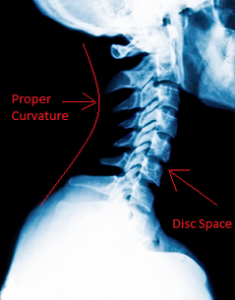 The degree of spinal degeneration can vary significantly between individuals. Genetics and previous injuries could also be reasons one person has more signs of arthritis than another. Tight stiff joints that are worse in the morning are typical signs. Maintaining motion in arthritic joints is the best defense against this disease. Progressive arthritis can lead to more a more serious condition spinal stenosis. This is when the nerve pathways of the spine become occluded by the bony spurs that develop over time. One indication of this can be a pain, as well as, numbness and tingling “shooting” down the arm to the hand. This condition is often manageable early on with proper treatment such as chiropractic and exercises. When weakness develops it is time for a surgical consultation. Look at these two x-rays. One shows proper curvature and good joint spacing, while the other reveals arthritis in the form of bone spurs and thinning intervertebral discs. Chiropractic along with several other complementary approaches can help alleviate active cases and reduce future episodes of neck pain. Your first defense does not have to be drugs and injections. In fact most insurances want to you attempt a trial of conservative care, such as chiropractic or physical therapy prior to authorizing addition test and/or procedures.